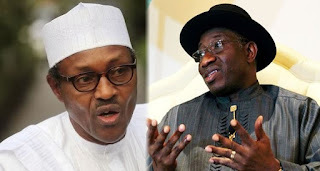 Goodluck Jonathan, former President has alleged that the Federal Government under President Muhammadu Buhari is characterised by lies and propaganda. Jonathan spoke in Abuja on Thursday when he received one of the national chairmanship aspirants of the Peoples Democratic Party, Prof. Tunde Adeniran, and members of his campaign team in his office. The party will hold its national convention in Abuja on December 9 to elect its national officers. While pledging to speak up some day on the achievements of the PDP in its 16 years in power, the former President took a swipe at the Minister of Works, Power and Housing, Mr. Babatunde Fashola (SAN), who as a state governor reportedly said that a serious government at the centre must be able to fix power within six months. Jonathan was the president when Fashola made the statement. The former president observed that more than two years of the APC Federal Government, to which Fashola belongs as a minister, the government had not been able to fix power. He noted that Fashola who made the statement is incidentally in charge of power today. Jonathan said the Buhari government had not done anything since it came to power on May 29, 2015. “The PDP administration for 16 years did well and will continue to do well but this administration has done nothing. They deployed propaganda and lies at a professional level. “In the power sector, we did well to revive it. A state governor attacked our government, saying that any serious government should be able to fix the power challenge within six months. Extolling the qualities of Adeniran, Jonathan reminded members of the PDP not to forget that for the party to stand a chance to oust the APC in 2019, the party would need a competent, reliable and courageous national chairman who would lead the party to victory come 2019. According to him, the PDP “needs a national chairman that will select credible and reliable candidates for various elective offices at the various levels of government from the presidency down to the councillorship. Jonathan said that with his long interaction with Adeniran and testimonies of other party leaders, he possessed all it would take to lead the PDP to new heights. In his remarks, Adeniran said he was not in the contest for fun, stressing that the need to rebuild and reposition the PDP ahead of the 2019 general elections informed his decision. “Nigerians are waiting. Till now, more than 3/5th of Nigerians are still sympathetic to the PDP,” he said. On Adeniran’s delegation were former ministers, Abba Moro (Internal Affairs); Zainab Maina (Women Affairs); Jerry Gana (Information); and a two-time Speaker of the Edo State House of Assembly, Friday Itulah, among others. When contacted for reaction to Jonathan’s allegation, the President’s media team referred one of our correspondents to the All Progressives Congress. The National Publicity Secretary of the APC, Mallam Bolaji Abdullahi, was however unavailable for comments. Calls to his mobile phone were neither picked nor returned. In his reaction, the Minister of Power, Works and Housing, Babatunde Fashola, stated that Jonathan did not have the right facts. The minister, who spoke through his Senior Special Adviser on Communications, Hakeem Bello, stated that it was unfortunate to know that Jonathan would accuse the current government of not doing enough in the power sector. He said, “It is unfortunate that the former President does not have his facts right. This is because there was nowhere that the current Minister of Power, Works and Housing and former Governor of Lagos State said he could fix Nigeria’s power challenges in six months.